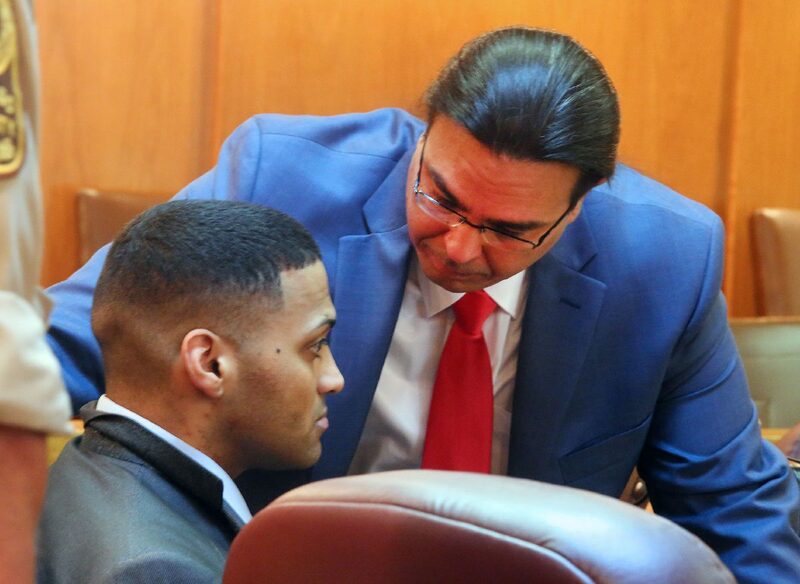 Victor Lee Alfaro, 27, left, listens to his defense lawyer O. Rene Flores during his murder trial in the shooting death of 21-year-old Reynaldo Reyes Jr. in the 332nd state District Court on Wednesday, March 28, 2018, in Edinburg. 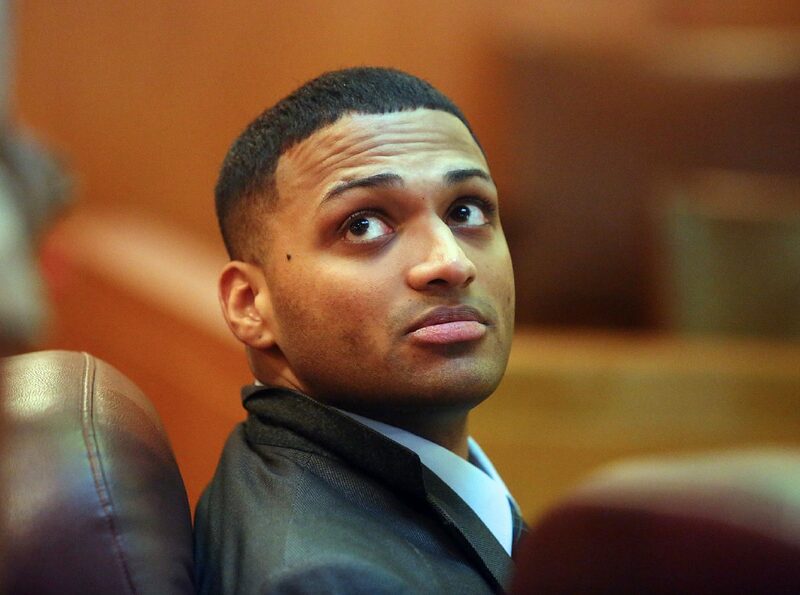 EDINBURG — A judge declared a mistrial Thursday in an Edinburg murder trial after jurors could not come to a consensus about the fate of Victor Lee Alfaro. Alfaro, 27, is accused of fatally shooting 21-year-old Reynaldo Reyes Jr. in May 2016 in the apartment Reyes shared with his sister. Jurors began their deliberations Wednesday and returned Thursday, but after more than 13 hours, could not reach a unanimous decision. Notes the jurors sent to the judge revealed that Reyes’ sister’s testimony early on in the two-week trial likely planted doubt in some jurors’ minds. Nancy Lopez testified that Alfaro — a man she was at the time romantically linked to — loaded a 9 mm handgun in front of her while in her bedroom, and that shortly after he left her room she heard multiple gunshots from Reyes’ room. Lopez told jurors Alfaro apologized to her before giving her the weapon and fleeing the apartment in her car. A neighbor testified that she saw Alfaro leave shortly after the sound of bullets rang out in the apartment complex. Defense attorney O. Rene Flores questioned Lopez’s account, calling the inconsistencies in her version of events lies. Shortly before jurors announced that they could not reach a decision, they sent a note to the judge asking how to weigh the credibility of a witness. They were in turn told to use their common sense. Lopez’s testimony was likely a critical piece of evidence for jurors, as not all physical evidence linked Alfaro to the crime. His fingerprints were not found on the gun or the gun’s magazine, and no DNA was found on his clothes. The prosecution, however, emphasized that gunshot residue was discovered on his clothing. While only a small particle of residue was found on Alfaro’s hands — which the defense said could have been deposited when officers handcuffed him after he was apprehended a few hours after the shooting — the prosecution pointed to Lopez’s testimony that Alfaro had worn gloves while handling the gun. Reyes’ family, along with members of Alfaro’s family, were in the courtroom Thursday, and the victim’s family was visibly upset by the announcement of a mistrial. District Judge Mario Ramirez Jr. told the defense he would not reduce Alfaro’s bond and that Alfaro will remain in custody until the case is retried. No date has been set for the new trial.